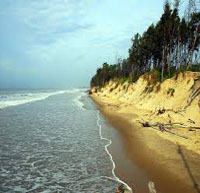 Shankarpur is a virgin beach town located 14 km east of Digha in West Bengal. It is also a regular fishing harbour. The mornings are cool, when fishermen can be seen hauling their huge nets out of the sea. The morning sun reflecting on the sea waves in the east, and the local fishing boats on the coast offer excellent photographic opportunities Shankarpur contains a number of temples. Located in the Purba (East) Medinipur District of the state of West Bengal, Shankarpur is a beach destination along the Digha-Contai Road which is fast gaining popularity. 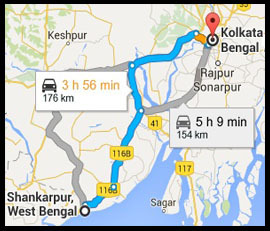 It is at a distance of about 185 km from the capital city Kolkata, and about 14 km from the famous beach town Digha.